One of the most common and most misdiagnosed processing problems in children is a blocked writing gate. This is the number one processing glitch in gifted children. Many of these children seem to be “allergic” to their pencil. They break out in whining as soon as they get a pencil or pen in their hand. This particular blocked learning gate or “energy leak” can be called a grapho-motor processing problem, a visual/motor integration problem, a fine motor problem or dysgraphia. This often explains the mystery of why many children and students learn their spelling words easily by writing them in a workbook or writing them five times each, and another child can write his words hundreds of times and still not store the spelling word in his long term memory. Now we realize that this struggling child has to use his “battery energy” just for the writing process, so the spelling words cannot be transferred into the right brain, where our long-term memory is stored. Thus, the method of copying to learn is totally ineffective for this child. Our job is to recognize this, and to help him open up his writing gate. This can easily be done in the home setting. No child has all of these characteristics, but if your child or student has several, you may consider that this is an area that he or she is struggling in. When a parent or teacher recognizes that this child has a blocked learning gate, and is just not being sloppy or resistant to writing without a reason, then some steps can be taken to alleviate some of the writing burden on the child, until the problem can be corrected. Reduce the amount of writing a child needs to do during the day. Do more answers for chapter questions orally. Limit the amount of writing in workbooks. Reduce or eliminate copying for 3-4 months. Save the child’s battery energy” for writing paragraphs or papers and doing math. Teach the child keyboarding for some writing projects. However, it is important to remember that most children who have dysgraphia also find keyboarding quickly quite labor intensive also, so it is not a complete answer. 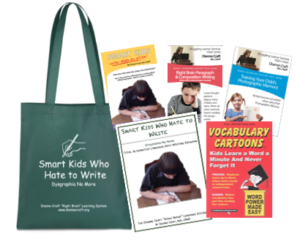 The DVD, “Smart Kids Who Hate to Write” demonstrates a daily exercise to do at home or in a tutoring session that crosses the midline to open the child’s writing gate, which increases writing fluency and eliminates reversals. This daily 15-minute exercise rehabilitates the Visual/Spatial system. No more left/right confusion! Use the Daily Lesson Plans for the Struggling Writer and Speller. This includes the daily method that Dianne used with her bright students with a glitch when teaching them in a school setting. At the end of the year they were all writing short papers, and their spelling had improved by 3 years. This is a free download on Dianne’s website. (Ages 1st-9th grades). Teachers, tutors and parents can easily use this. A child can have a learning glitch, or block in a learning gate, that causes him to struggle everyday with schoolwork, without the parents’ knowledge. Using some simple checklists, the parent can identify this problem, and design the school day to be less frustrating. More importantly the parent can avail herself of all the wonderful corrective techniques available, so that the child does not need to struggle with the burden of having to work so hard at writing, or with a dysgraphia. God has wonderful answers for us. He leads us in so many ways, and we are ever grateful! This is often confusing for parents. Simply put, Dyslexia involves much difficulty reading and spelling. Dysgraphia involves much difficulty writing. Many children/teenagers with Dyslexia often have an accompanying Dysgraphia. They write almost no sentences from memory, since their right, visual hemisphere is not storing words efficiently. They have to think about the directionality of the letters, rather than the content of the writing. Kids with Dyslexia almost always also have Dysgraphia also. However, many kids who do not have Dyslexia, and in fact, may read way above grade level have just the Dysgraphia. See my article, “Smart Kids Who Hate to Write” on my website to see this subject described in depth. Be assured, this issue is also easy to correct at home.